Wes Rizor was the first “Olympian” to carry the torch and he repeated the feat this month at his alma mater. The Leuzinger High School athletes are called the Olympians. Leuzinger High School in Lawndale opened Jan. 27, 1931. Today, it is in the Centinela Valley Union High School District. Leuzinger’s first senior class graduated while the 1932 Summer Olympics were hosted in nearby Los Angeles. Consequently, the school’s mascot became the Olympians. A 1963 graduate, Rizor was a high school track star. In the fall of 1962, the high school obtained permission for the “lighting of the torch” as the school symbol and Rizor was asked to be the first to carry it around the football field during half-time. This September, his graduating class held its 50th reunion. Since the school has been renovated, the current principal asked Rizor if he would repeat his 1962 run. Rizor was happy to reprise his role and did it at the Oct. 11 game. Rizor, who still holds the school’s record for the mile, went on to a successful college track career before the military and then eventually a firefighter career ensued. Leuzinger was granted authorization for the school to use the Olympic name and Olympic rings trademark. In turn, the campus of the Olympians also provided staging for aspects of the 1932 Olympics. 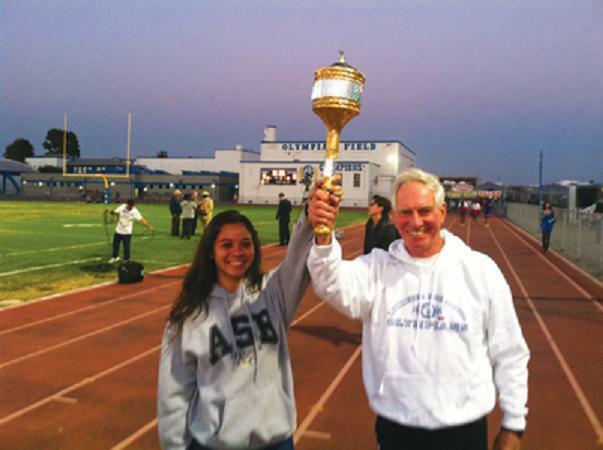 Wes Rizor (right) and the current student body president of Leuzinger High School in Lawndale hold the school’s torch. The school opened in 1931, a year before the Los Angeles Olympics, thus, the Leuzinger “Olympians.” Rizor rededicated the torch just as he did when it was originally dedicated 50 years ago.